You are here: Home / Massage / Neck & Shoulders Massage / How To Relieve Neck And Shoulder Pain At Home? There are many factors that can play an atrocious role in causing neck and shoulder pain. After all, your neck and shoulders comprise of numerous important components that can be affected such as nerves, muscles, bones, arteries, veins, ligaments and other supporting structures. While some of the pain is associated with life-threatening conditions such as heart attack and trauma, others are simply caused due to strains and contusions that occur because of sleeping wrong, poor posture, or a lack of exercise etc. 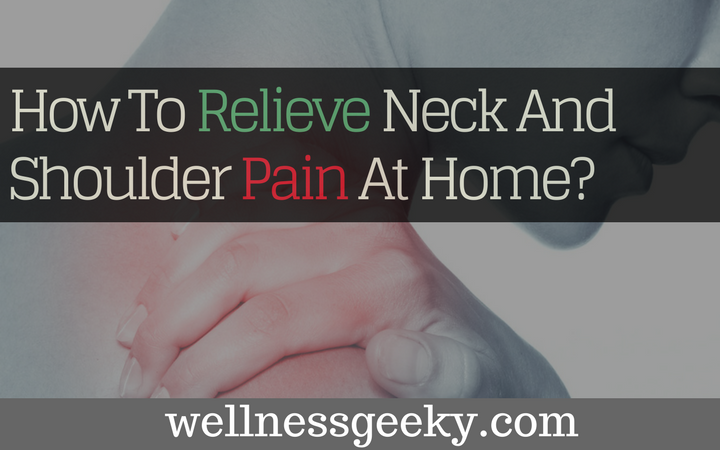 Before we discuss the ways and methods you can use to relieve neck and shoulder pain at home, but it is important to understand what causes the pain in the first place. What happens when you suffer from shoulder and neck pain? Getting to the point—so, how to relieve neck and shoulder pain at home then? More often than not, you experience pain in the shoulder and neck because of whiplash or injuries to soft tissues such as ligaments, tendons and muscles. You can also feel a sharp pain from a broken collarbone. Do you know that heart attacks can also cause shoulder or neck pain? Basically, the neck and shoulder pain associated with heart attacks is generally called ¨referred¨ pain. Other causes of shoulder and neck pain can include a broken shoulder blade, rotator cuff injuries, shoulder or A-C separation, whiplash injury, tendonitis, and gallbladder disease etc. When you have shoulder and neck pain, the pain that you experience can vary from dull, crampy, shock-like, burning, or stabbing. Of course, when you suffer from shoulder and neck pain, you also have a loss of range of motion, causing severe, throbbing headache. You shouldn´t be shocked to see swelling in your neck and shoulder area. Muscle tightness or spasms may stimulate actual swelling. It is possible for you to treat your neck and shoulder pain at home, provided that the pain is only caused by minor injuries and strain. If you are not certain about the cause of your pain, and if you suffer from symptoms that suggest that you have a more serious condition, you shouldn´t shy away from contacting your doctor as soon as possible. There are also stretches you can perform after a long, hot shower for instant neck pain relief or by using best neck massagers and shoulder massagers. For instance, you can perform the seated neck release. To perform the exercise, you will need to sit in a cross-legged position. Then, you should extend your right arm next to your right knee. After that, you must place your left hand on the top of your head and slowly tilt your head to the left. If you want to increase the stretch, you can apply gentle pressure with your hand. After holding on to a particular side for 30 seconds, you can then repeat this stretch on the other side. It is of paramount importance for you to take proper rest and limit your movement with the injured area as much as possible for a couple of days. After a few days, you can start your rehabilitation by slowly exercising the injured area. If you want to expedite your recovery, you must rest! More often than not, neck and shoulder pain are caused by a muscle strain or sprain. Therefore, in order to prevent neck and shoulder pain, you should attempt to relax your muscles. You can decrease your chances of neck and shoulder pain by consuming magnesium, a mineral that aids in the relaxation and contraction of muscles. The ice in your fridge can be used to not only keep your beverages chilled and how you like it, it can also be used to treat your neck and shoulder pain. All you will need to do is to place the ice in a plastic bag and proceed to wrap it with a towel. You can then apply the ice to the injured area for a period of around 18 minutes every hour. If you want to avoid damage to your skin, you must avoid applying ice directly to your skin. If you want to improve your chances of decreasing the swelling and reducing the pain, you should elevate the injured area above your heart. You can use pillows to prop yourself up. If you don’t want to aggravate your neck pain, it is essential for you to not cradle your phone in the neck while talking. You must stop doing so because it puts unneeded strain on your cervical spine. You should also avoid craning your neck down to look at your phone. If you want to reduce neck pain, you should stay hydrated at all times. How can water help you? Well, you will need water to maintain your spinal alignment and disc height, and to take extra load off of the spine. The cervical discs continue degenerating as we grow older. However, if you want to maintain them, you should maintain strong daily hydration habits. If you are not strapped for cash, why don´t you acquire a neck-supporting chair? A neck-supporting chair ensures that you maintain a good posture, and, thus, keeps your neck pain under control. If you want to reduce strain on your neck, you must keep your cervical spine in a neutral position and you can only do that by using a headrest.